The Upper Mississippi River Valley (UMRV) American Viticulture Area (AVA) established by the Federal Government in June 2009. 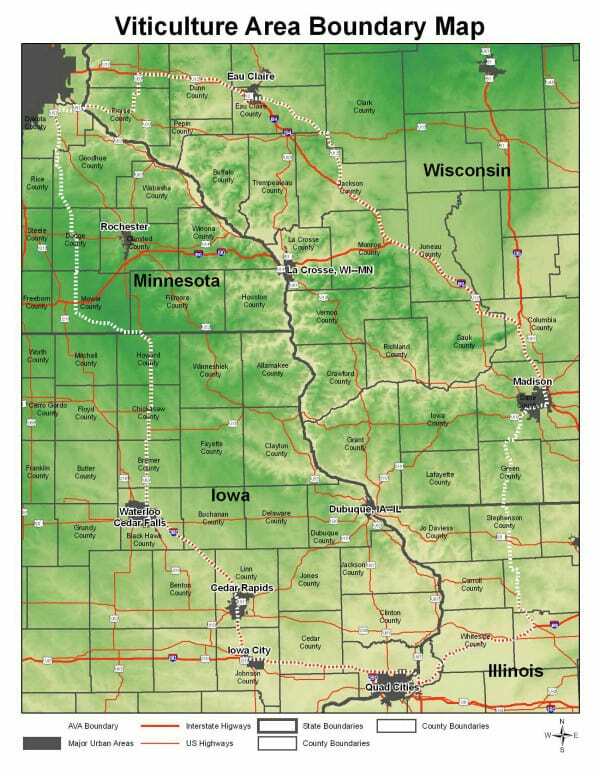 The AVA is the largest in the US and includes the drift-less or bluff-lands regions of Minnesota, Wisconsin, Iowa, and Illinois. Plan an extended visit this summer to explore this beautiful region of America’s heartland by following the Great River Road along both sides of the Mississippi River. Today, the UMRV AVA boundary represents 50+ wineries and 445 vineyard acres. Active programs and associations exist to help more wineries and vineyards to come on line in our four state area. Area grape growers appreciate the early 20th century work of Elmer Swenson. Swenson lived near the cross-roads of the four states involved in this petition and was responsible for introducing and further cultivating the French-American hybrids. These varietals carrying more diverse taste qualities can be depended upon for yearly marketability based on their winter hardiness and disease resistance. They carry a regional identification with names such as Frontenac, La Crescent, La Crosse, Marquette, St. Pepin and St. Croix.